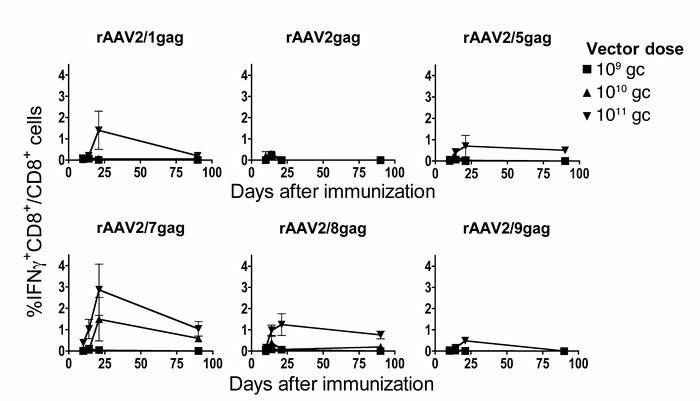 Vectors based on different AAV serotypes induce gag-specific CD8+ T cell responses. Groups of BALB/c mice were immunized with rAAV2 vectors carrying HIV-1 gag and pseudotyped with viral capsids from AAV1, AAV2, AAV5, AAV7, AAV8, and AAV9 at 3 different doses: 109, 1010, and 1011 gc. At various time points (days 10, 14, 21, and 80 shown here), splenocytes were stimulated with the AMQMLKETI peptide and analyzed for gag-specific IFN-γ–producing CD8+ T cells by ICS. Frequencies shown are representative of 3 experiments. Background frequencies (less than 0.1%) were subtracted prior to plotting. Error bars represent SD for 3 mice per group.